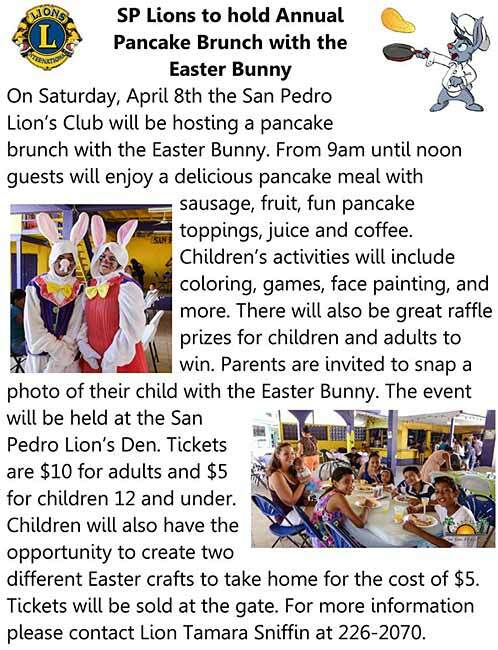 On Saturday, April 8th the San Pedro Lion’s Club will be hosting a pancake brunch with the Easter Bunny. From 9am until noon guests will enjoy a delicious pancake meal with sausage, fruit, fun pancake toppings, juice and coffee. Children’s activities will include coloring, games, face painting, and more. There will also be great raffle prizes for children and adults to win. Parents are invited to snap a photo of their child with the Easter Bunny. The event will be held at the San Pedro Lion’s Den. Tickets are $10 for adults and $5 for children 12 and under. Children will also have the opportunity to create two different Easter crafts to take home for the cost of $5. Tickets will be sold at the gate. For more information please contact Lion Tamara Sniffin at 226-2070.